If you’ve ever found yourself in the midst of a family argument and stumbled upon a collection of family photos from a fun vacation, you’ll understand the value of design artifacts. Design artifacts recall pieces of a larger puzzle, which can bring a more balanced perspective in difficult times. Artifacts present a particular view of a problem or relationship that can be shared with others. They’re often things you can print and tack on a wall for all to see. Their job is to show one thing clearly — to do that they have to exclude lots of other information. Today, let’s look at the research phase of creating a form, focusing on one type of artifact that creates a singular portrait of the user — a customer journey map. A customer journey map helps you understand the larger context of an interaction. It shows what happens leading up to the time when a person finds your form, how customers feel and behave while completing the form, and what happens after the interaction is complete — all from the perspective of the customer. A journey map creates a space where it’s ok to be 100% customer-focused. Other artifacts will be devoted purely to the organization’s needs. With a journey map, you set aside all the needs of the organization and focus solely on the user experience. Not having at least some artifacts that are dedicated to the customer is like asking a jury to decide a case where the prosecution and defense are all talking at once over giant pile of unlabeled evidence. A journey map is a pure representative of the defendant’s customer’s experience. Without it, the jury employees will blend the evidence together in their heads, making all kinds of assumptions about the defendant customer. In this case, we’re creating an application form, but the map puts that activity within the context of a much larger relationship between the organization and user. When they’re researching options, they’re excited but also worried. Will they make the right choice, how do they wade through all this information, and so forth. The application process is the low point in the process. Anticipation and uncertainty is at its peak, and, let’s be honest, no one likes filling out application forms. The first weeks of school are a period of adjustment but, assuming all goes well, parents are quite happy. During the school year, assuming the school is providing everything it promised, families are also quite satisfied. After the child ages out and leaves the school there’s more variation. Families may have no relationship with the school other than to communicate value to peers; they could have more children who might attend, in which case they may start the cycle over again; or they might continue to support the school for a time in some capacity. There are varying degrees of opportunity for the school during this phase. As we’ll see, having a way to present the big picture can be helpful later when others within the organization may want to prioritize the organization’s short-term interests. For an introvert like me, this is difficult. You can use Google Analytics (GA) to identify how people from particular sources behave on the company’s website. For example, compare how people who land on a blog post from a Google search behave versus people who come from social media sites or from your Google My Business listing. Once you’ve identified quality traffic, create a pop up for the company’s website that invites people to answer a few screening questions. Consider having the pop up trigger based on conditions specific to your form’s needs. For example, if you’re revising a donation form, you might want to only show the screener to first-time visitors to your donation page. You don’t want to show it to everyone who visits the home page. Then, use what you’ve gleaned from analytics to produce screen questions that help filter out less-desirable candidates. If traffic from Facebook has a high bounce rate and few conversions, use your screener questions to help filter out Facebook users. You might ask: “How did you find us today?” and provide multiple choice answers. The goal is to interview people who can represent those who are more likely to actually use your form. Your screener may let you set conditionals to automatically invite qualified candidates to an interview, or you may need to contact viable candidates to schedule a time. I like using Calendly, which lets people pick from available times on your calendar, which makes for less back and forth for everyone. You’ll need to offer some sort of incentive for participants. I like to use Amazon gift cards. You can send them yourself once the interview is complete or use User Interviews, which will handle it for you. Some of this may be asked in the screener, but interviews have the benefit of helping you gather much richer information — one of the critical pieces you can’t get from an online survey is how they feel at every point along the way. Interviews are like user tests — after 4 or 5 of them, you’ll have pretty much all the information you need. Take copious notes or record the conversation. Identify the phases before, during, and after completion of your form within the larger context of the customer’s relationship with the organization. 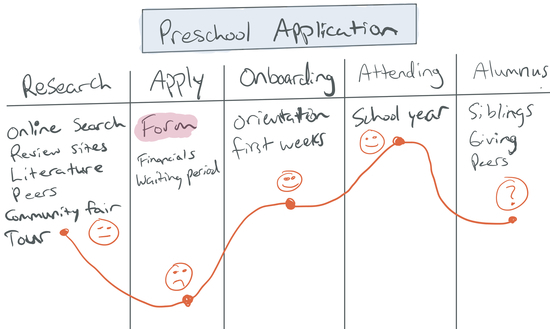 Use the information you gather about how people feel at various points to show the emotional ups and downs of that relationship, just as we saw in the preschool application example above. The map will come in handy when you’re working with stakeholders to determine what to include in the form, how it should function, and where and how often it should be presented to the user. It can be very hard for employees to understand the customer’s perspective. For someone in finance or legal who has spent years being paid to promote the organization’s interests, seeing through the customer’s eyes can be like being ejected into outer space. You’ll find people using every tool at their disposal to return to more familiar territory. People within the organization then have to make a deliberate and overt decision to prioritize internal needs over those of the customer. What matters is that a distinct, informed decision was made, and everyone within the team knows it. Trade-offs were acknowledged, and a clear message has been sent as to the direction of the product. PS. This is part 7 in a series on digital forms. You can catch up by reading parts 1, 2, 3, 4, 5, and 6. How helpful was this letter? This is a message from SuperHelpful, written by Kyle Bowen. You received this email because you signed up through our website or a client agreement. Don't want to hear from me anymore? No hard feelings — Unsubscribe. New to SuperHelpful Letters? Sign up here.